LAKEVILLE, IN. 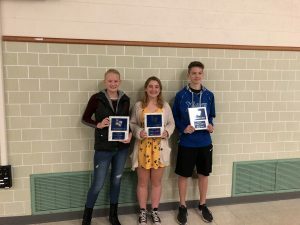 – The LaVille Co-Ed Cross Country program recently held its awards recognition program. Henry finished 54th in the IHSAA South Bend Sectional. Caleb Christy finished in 56th. Rock finished 49th in the IHSAA South Bend Sectional, while Eve Miller finished 53rd. Rock also finished in the Top 20 at the Hoosier North Athletic Conference Championships, just 52-seconds away from being selected All-HNAC. Miller was selected Indiana Coaches of Girls Sports Association Academic All-State Honorable Mention.